VATICAN CITY – Be ready with the spiritual weapon of faith because the biggest battle facing the Swiss Guard today is fighting the devil and worldly vices, Pope Francis told the guard’s members. The Swiss Guards’ colorful and valuable presence at the service of the pope and Vatican City State “is an occasion to grow as courageous ‘soldiers of Christ’” and be witnesses of holiness to countless tourists and visitors, he said. The pope held a private audience with the Swiss Guard, including 40 new recruits and their family members, the morning of May 6, the day of the guard’s annual swearing-in ceremony. New recruits pledge to “faithfully, loyally and honorably” serve and protect the pontiff and, if necessary, sacrifice their lives for him. 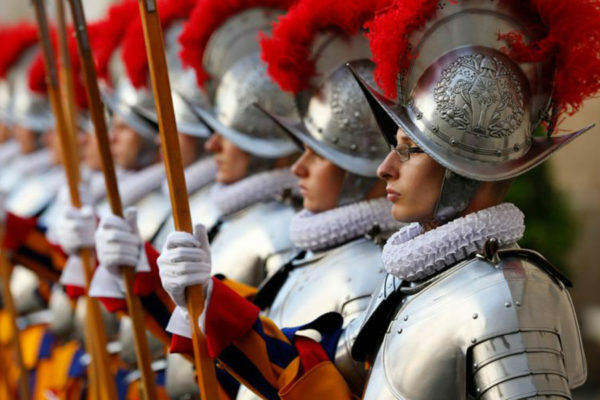 The colorful induction ceremony is held May 6 every year to mark the date in 1527 when 147 Swiss Guards lost their lives defending Pope Clement VII in the Sack of Rome. Only 42 guards survived. Holding the ceremony on the anniversary is meant to remind new guards of the seriousness of their commitment. Faith is an effective shield against the different “forces and powers of this earth and above all (against) he who is ‘the prince of this world,’ the ‘father of lies,’ who prowls around ‘like a roaring lion looking for someone to devour,’” the pope said. “You are called to be strong and valiant, sustained by faith in Christ and his word of salvation,” he said. Today, the 110 Swiss soldiers are responsible for guarding all entrances into Vatican City State as well as keeping watch over the pope and his residence in the Domus Sanctae Marthae. They also provide security and ceremonial services during liturgical events and visits of heads of state and other dignitaries to the Vatican. At the swearing-in ceremony in the Vatican’s St. Damasus courtyard, the corps’ commander, Col. Christoph Graf, told the new recruits that when it comes to human resource management, the best and most successful guidance comes from the Bible and its emphasis on humility, honesty, compassion and loving one’s neighbor. Also, a “superior” or leader is only credible and successful if he or she acts as a role model, living the way he or she demands others live, Col. Graf said. “Whoever wants to lead with success must first learn to love people,” he said. “Where is the voice of us Christians? It can’t be that the only one to speak out publicly about these situations is the Holy Father,” he said.